Congratulations to all riders and horses who competed in last weekend’s show at Camperdown Equestrian Centre, and thanks as always to the trainers, parents, and other supporters who were on hand to make the weekend a success! riders to compete all over the United States and Europe. As so many of our guests judges do, at the close of the show he was kind enough to take time to speak to interested riders, encouraging them and giving suggestions for improving their technique. Island, USA, who judged a show at Camperdown in November, 2016. 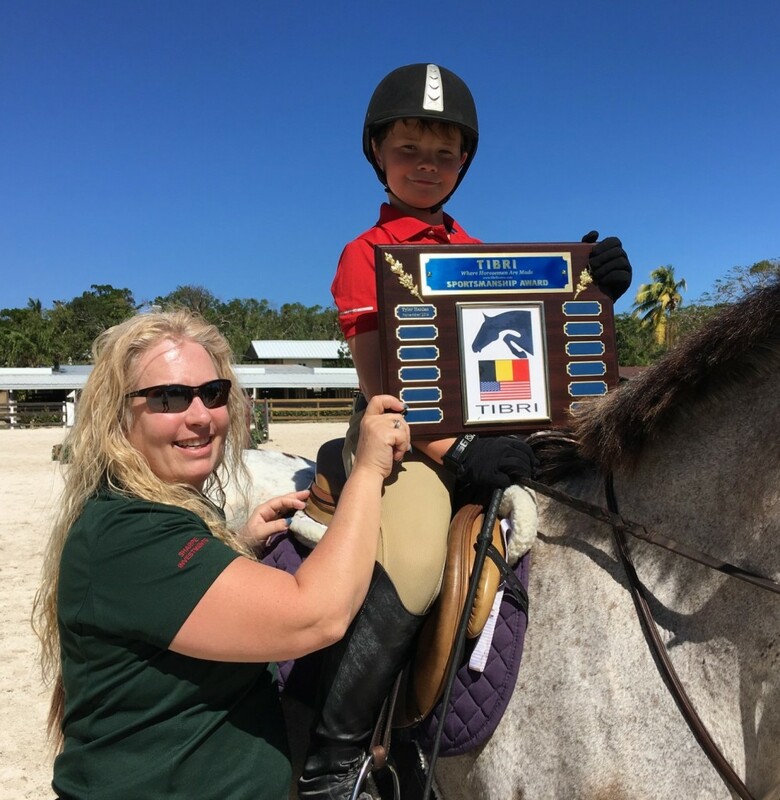 Mrs. Dotoli was so impressed with the attitude and sportsmanship of our young Bahamian riders that she undertook to sponsor the Tibri Sportsmanship Award, to be presented at each show to the rider who in the Judge’s opinion best exemplifies the principles of sportsmanship. Mrs. Dotoli specified that Ms. Tyler Hanlan, a Camperdown Equestrian Centre student, was to be the first recipient of the award. Tyler caught Mrs. Dotoli’s eye at the CEC November show for remaining calm and looking first to the safety of her horse even when things did not go well in the show ring. Mr. Robold then had the privilege of selecting the February recipient – and the lucky young man was Anton Gottberg from Mariposa Stables, who “demonstrated a sportsmanlike attitude to everyone around him, both on and off the horse.” Congratulations to Tyler and Anton for demonstrating that sportsmanship is every bit as important as winning ribbons! See you next month at CEC for the Annual Rotary Clubs Horse Show (March 11-12), when the two-day final of the Bahamas Junior Classic will be contested! Admission is free, and all are invited to attend.